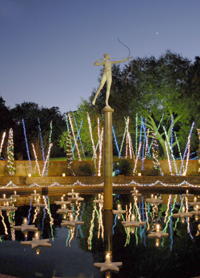 It’s time for South Carolina’s Nights of a Thousand Candles festival at Brookgreen Gardens. The gardens will be decorated with over 5,500 lit candles and lights! There will also be caroling, apple cider, nightly entertainment and indoor exhibits. The festival runs from December 2-3, 9-10, 15, 16 & 17, 2011 from 3 – 10 p.m.
For more information about Nights of a Thousand Candles, visit BrookgreenGardens.